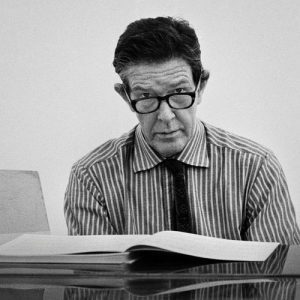 John Cage is widely recognised as one of the most important creative thinkers of the 20th century. A noted polymath, Cage was a revolutionary composer, an artist, writer, philosopher and even an expert mycologist. His influence has been both broad and deep, particularly in the visual arts where his explorations of sound and silence, multimedia performances and chance methodologies have had a tremendous impact. The son of an inventor father and journalist mother, Cage flirted with painting and architecture before pursuing his studies in musical composition. His interest in unconventional structures led Cage to the great Arnold Schoenberg, who offered to teach him for free if he promised to dedicate his life to music. While he remained faithful to this promise, Cage’s work pushed the very concept of music to its absolute limits. His work embraced all kinds of sounds, as well as its absence – a phenomenon most famously explored in his 1952 conceptual work 4ʼ33” in which the performer is instructed not to play their instrument for four minutes, thirty-three seconds in order to draw attention to the ambient sounds of their surroundings. Cage’s practice was largely shaped by Eastern spiritual teachings. From 1951 onwards he relied on the I-Ching, an ancient Chinese text that can be used for the selection and ordering of chance events. This text enabled Cage to dispense with free will and personal taste, and to introduce indeterminacy through a preordained set of parameters. His ideas were also generated though contact with art and artists. Upon moving to New York in 1942, he stayed with Max Ernst and Peggy Guggenheim and through them met the most influential artists of the era, including his idol Marcel Duchamp whose own practice had notably incorporated chance. In the early 1950s Cage tutored at Black Mountain College, where he organised the first ‘happening’ and befriended Jasper Johns and Robert Rauschenberg. The young artists became key collaborators in the productions Cage staged with his lifelong companion, dancer Merce Cunningham, and he attributed his inspiration for 4ʼ33” to Rauschenberg’s white monochrome paintings. While many of his scores contained graphic interpretations of sound, Cage only began to fully explore his compositional processes with visual art late in life. His first major project took place in 1969 with a group of plexiglass sculptures made in honour of Duchamp, who had died in 1968. But it was not until 1978, following an invitation to create a series of prints at Crown Point Press, that Cage started to regularly dedicate his time to visual media. He continued to create prints, drawings and watercolours throughout the rest of his life. All of these delicately beautiful works are the outcome of chance operations, whether they comprise traced outlines of found stones or juxtaposed fields of colour. This rigorous dedication to eliminating the ego is evident in all aspects of Cage’s output and has been an inspiration to generations of artists, and indeed entire movements, including Minimalism, Conceptualism, performance art and the Fluxus group.